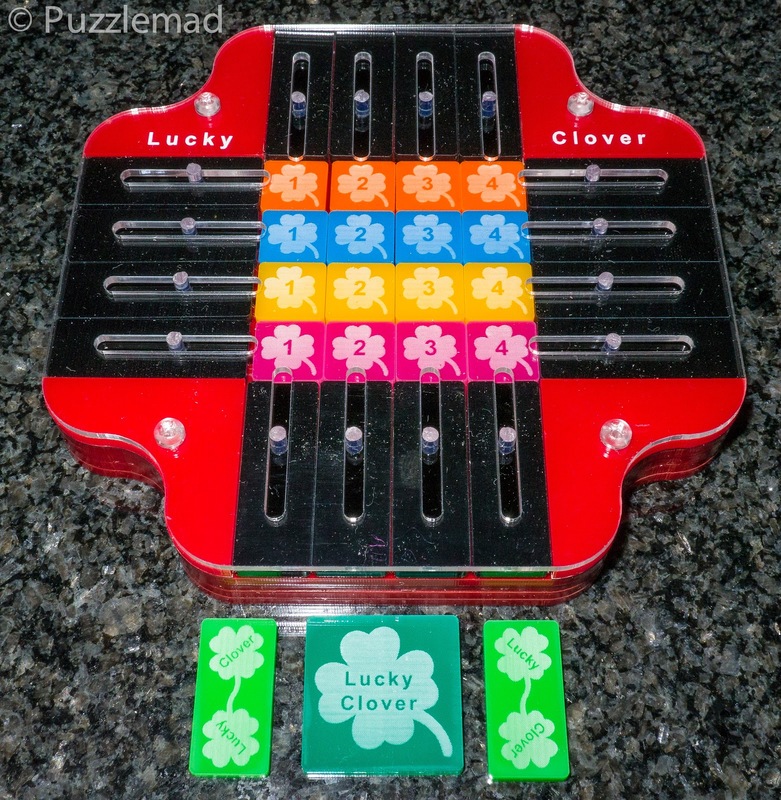 Puzzlemad New Additions: I've been rather bad recently! I've been rather bad recently! Last week began with me mysteriously (???) receiving 2 absolutely stunning works of art from Brian Menold. 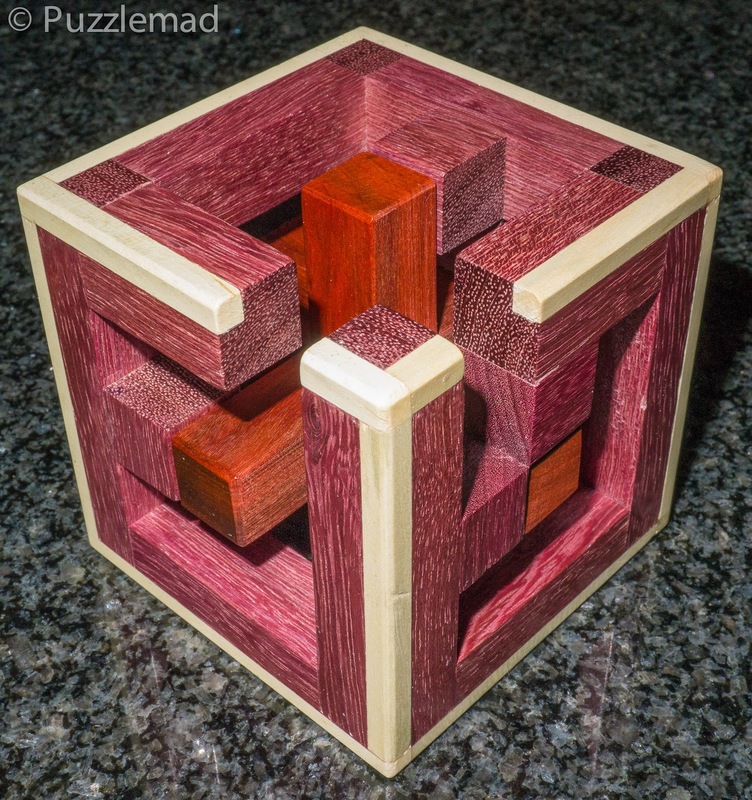 The 2 piece oddity was designed by Tom Jolly and is an interesting, if not particularly difficult puzzle - Brian's workmanship is amazing - here we see Purpleheart, Padauk and a Holly veneer. The 6 board burr in a cage was designed by Stéphane Chomine it is made from Granadillo for the cage with 6 Walnut and Olivewood pieces for the Burr The solutiom has a level of 17.8.9.3.3 and I have not yet managed to solve it. 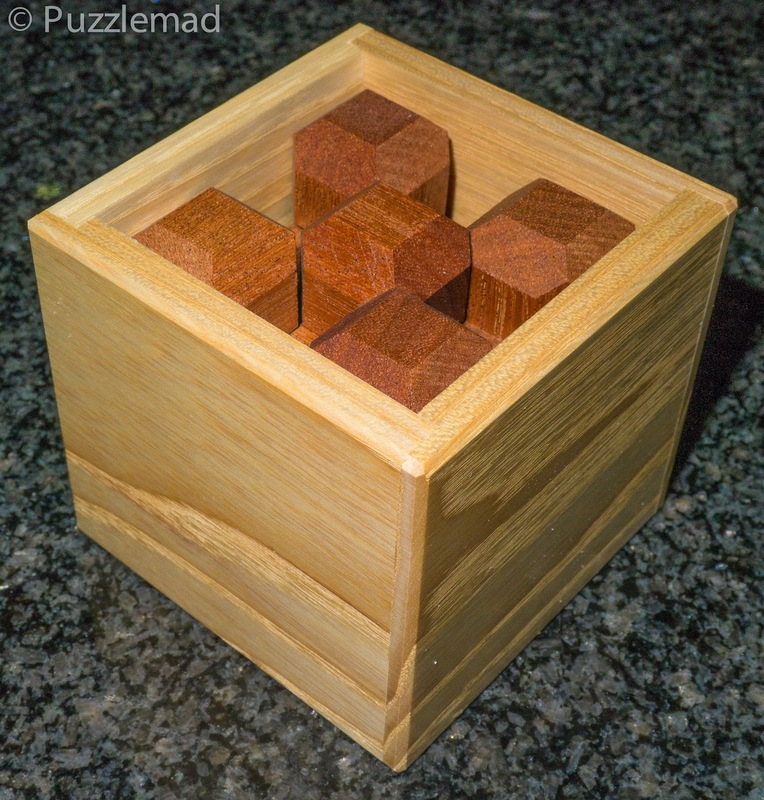 This pair arrived last Thursday from Eric Fuller - Pyrracube by Stewart Coffin is a packing puzzle made from Ash and Sapele - I am rubbish at packing puzzles but every now and then I try a new one to see whether I can improve! The Chesspoard is by William Hu and is made of Peruvian Walnut & Maple. A nice little challenge for me! 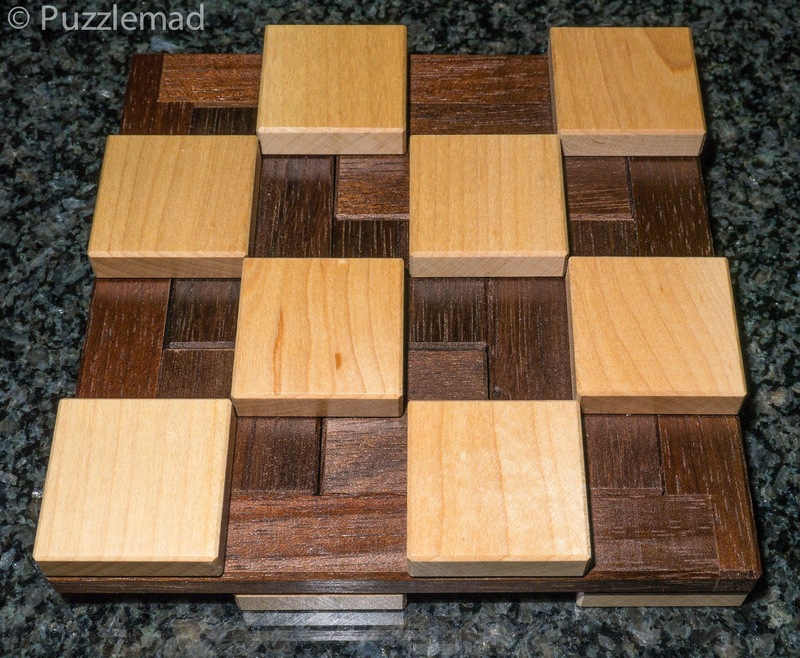 You cannot have too many twisty puzzles! Unbeknownst to me, I also had a delivery on Saturday whilst at the MPP - this is from Calvin at the HKNowstore. Here we have the Greg and Felix's 2x2 & Megaminx and the Moyu Wheel of time. 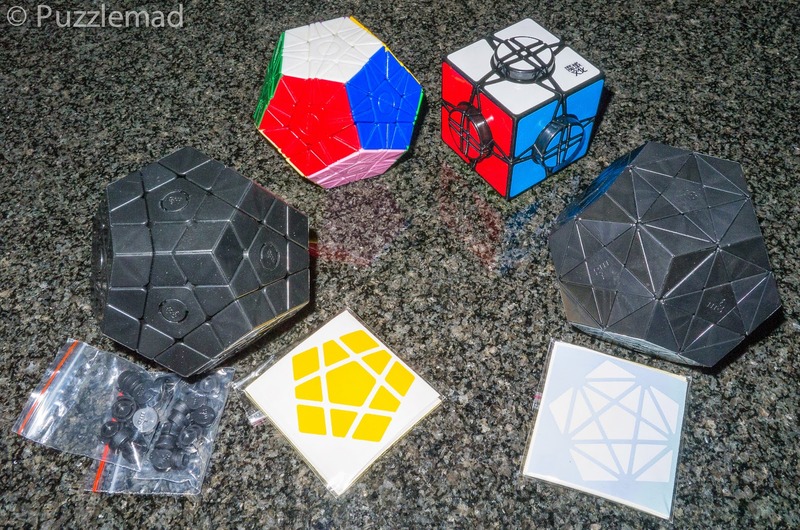 The un-stickered puzzles are Eric Vergo's Pentagram and the Constrained megaminx (with interchangeable centres) both from MF8. I have lusted after Lee Krasnow's barrcode burr for years but it has always been out of my reach. 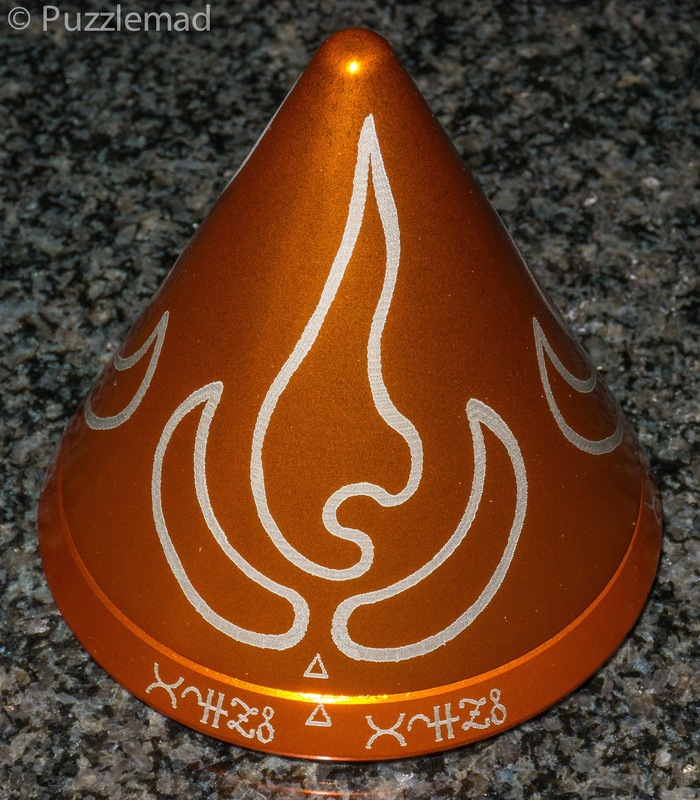 But a good friend got permission to make a few in plastic and I couldn't say no! This has some rather interesting movements! 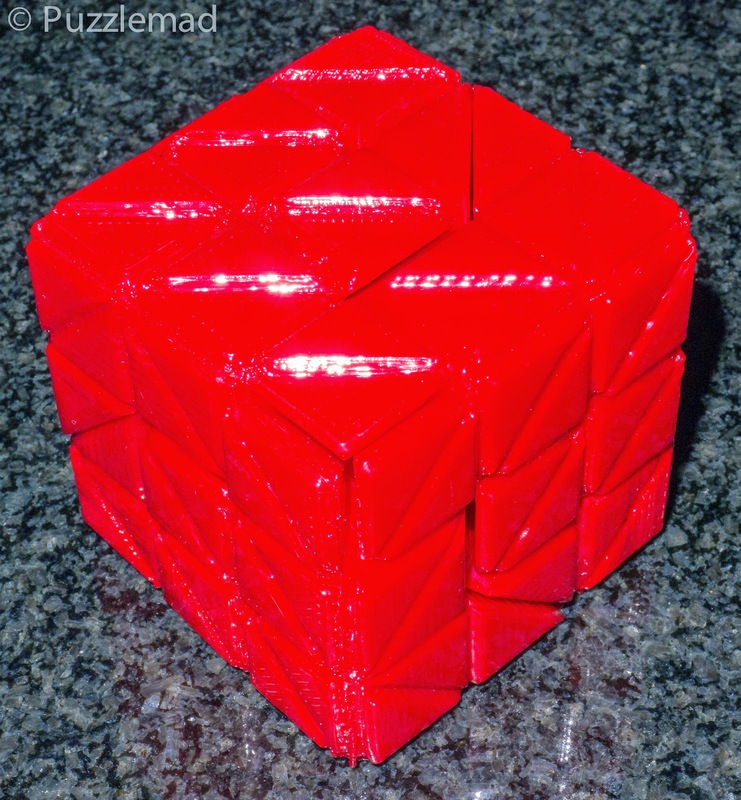 This printed plastic creation was given to me by Rich Gain - it is the Coronation cube and was his entry into the 2014 IPP design competition. 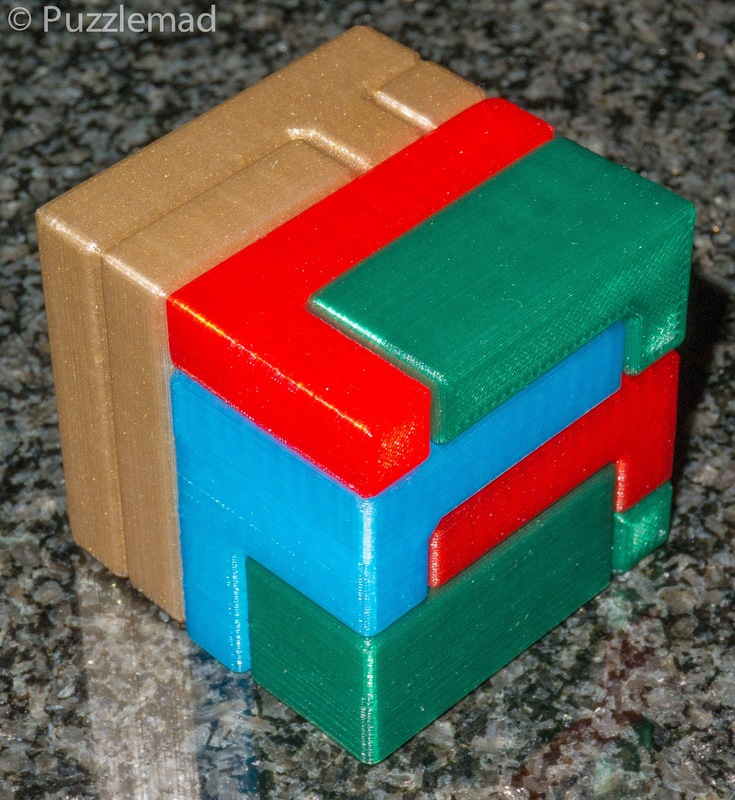 I solved it at the MPP and it has a lovely sequence of moves including one rotation! 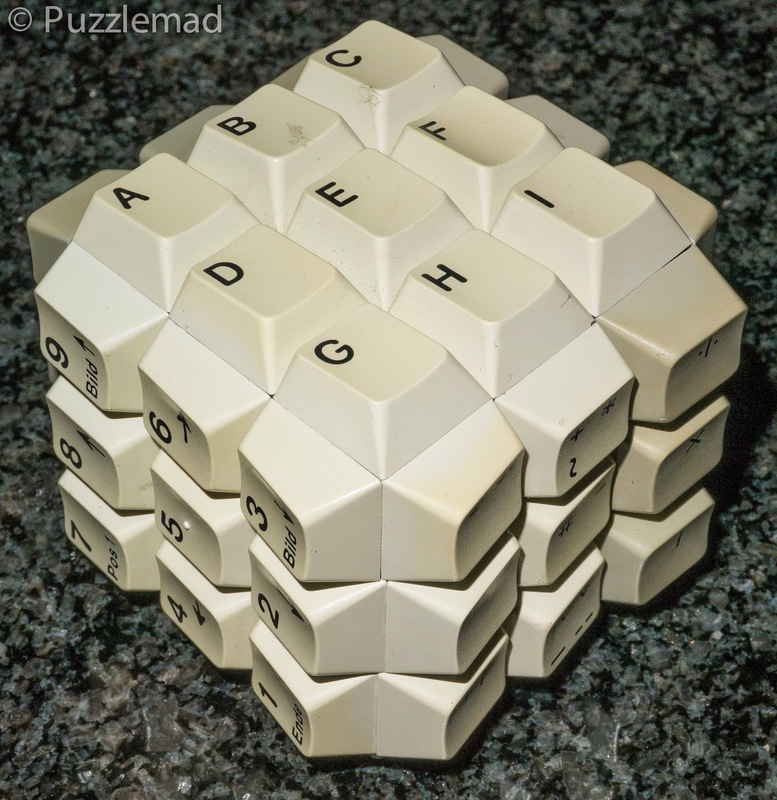 I couldn't resist buying this from Wil Strijbos - it is a sliding tile/sequential movement puzzle designed by Hans van der Zon and whilst I very much doubt whether I can solve it or the other 2 puzzles that can be made using the extra pieces supplied, I was totally captivated by the movements that were possible! This will provide me with hours and hours of fun! Wil gave me this as a gift - It is a keyboard converted to a 3x3 cube - unfortunately I realised last night that the keys are from a dutch keyboard! This will be a fun little challenge! 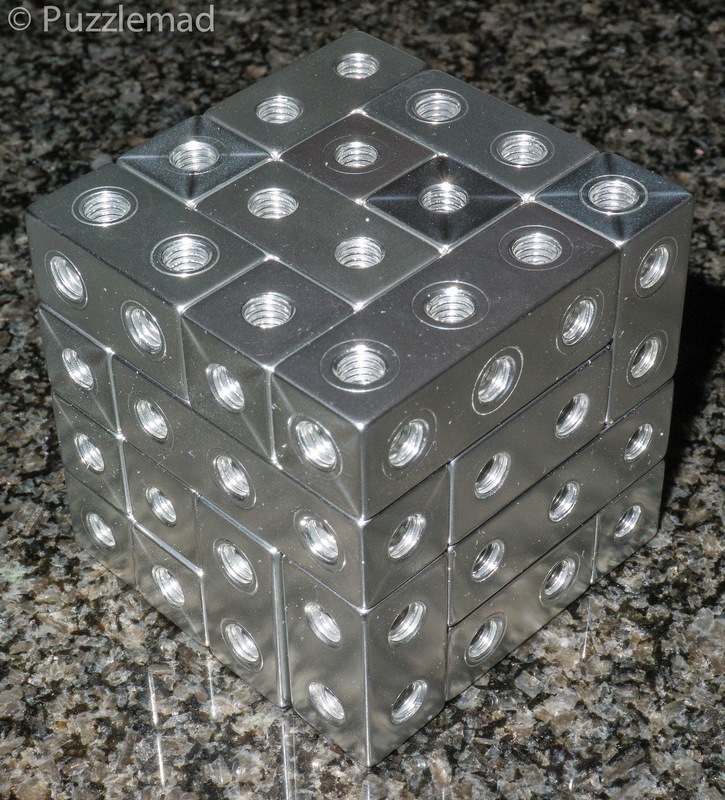 I bought 2 of these from rich gain - it is a shiny metal version of Livecubes and will allow me to experiment and make hundreds of different interlocking puzzles from Ishino's site. Having 2 sets means that I can go up to 5x5 and even 6x6 cubes for added fun! 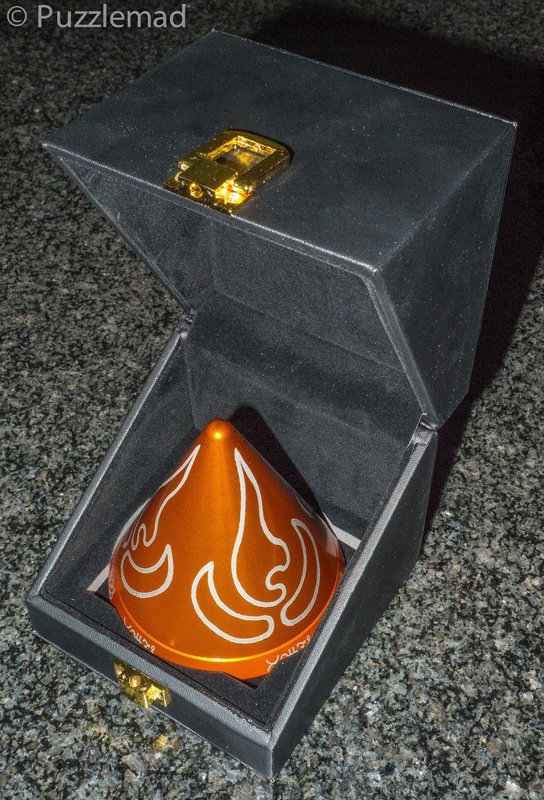 You all know that I cannot resist shiny things! I am sure that my friends Steve and Noella will want to play too - they love my shiny toys too!!! 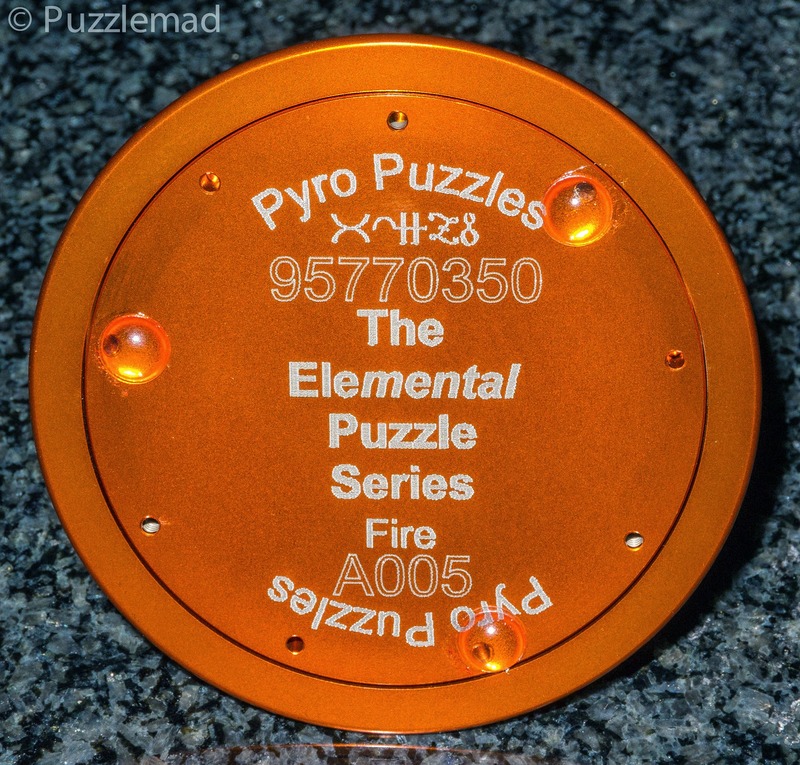 My friend Stephen Miller started Pyro puzzles and the first in his series of Elemental puzzle is about to be released - the Fire Puzzle is the first. Those of us at the MPP managed to get our copies ahead of the official release - mine is Number 5! 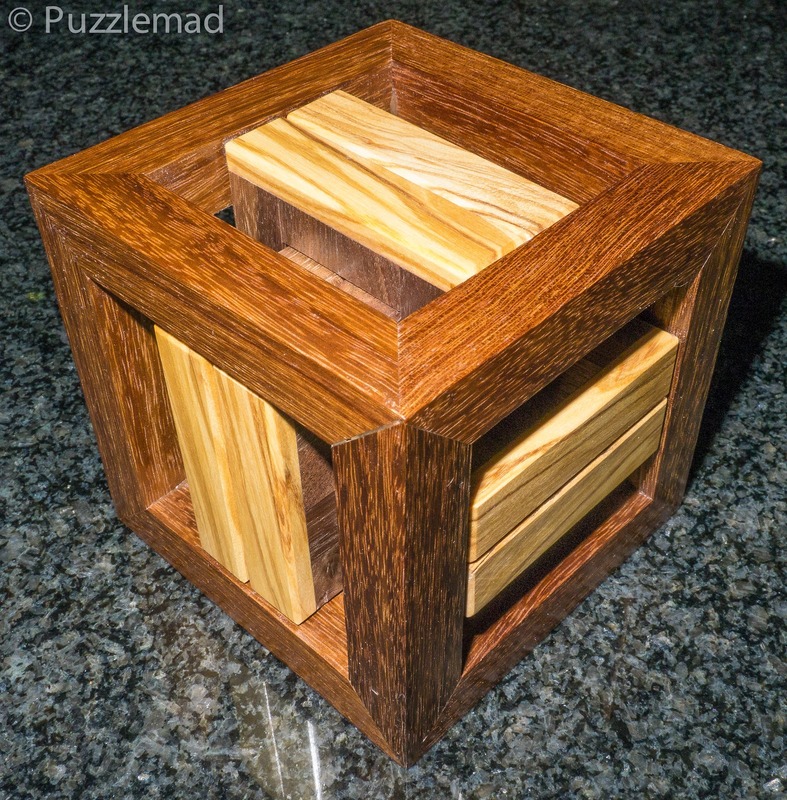 I have seldom seen such a beautifully made and packaged puzzle. I have not really done more than open it and play with the movement. There is a lot too this puzzle including deciphering clues as well as the mechanical aspect of it! If you haven't ordered one then be quick before they all go! 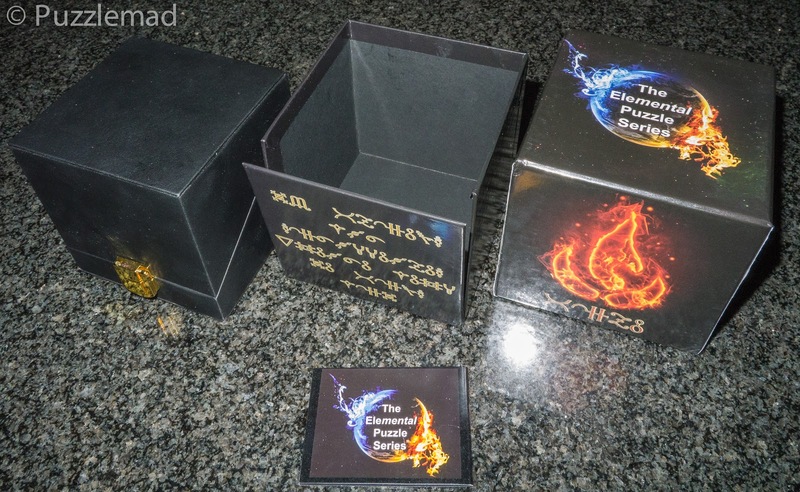 How about that for beautifully packaged? Just opening the box is a lovely experience! Look at the attention to detail - it even has feet!